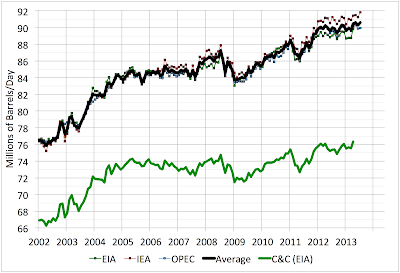 Stuart at Early Warning has his periodic oil production update - Monthly Oil Supply Update. The IEA is reporting a new high of global liquid fuel production in July, only a little shy of 92mbd (see graph above). OPEC does not agree, and of course the figures are often revised, so we'll have to see how this shakes out. At a minimum, it gives us something to think about, global oil supply having been a deadly dull flat series for the last couple of years. Maybe it's about to increase again?